San Diego County students outperformed their counterparts across the state in new Common Core curriculum testing, according to results that were released Wednesday by the state and will serve as a baseline for future testing. The California Assessment of Student Performance and Progress, administered to about 3.2 million students across the state in the spring, is vastly different from the previous Standardized Testing and Reporting program. The results of the new tests, therefore, cannot be compared to the previous year. "The results show our starting point as a state, a window into where California students are in meeting tougher academic standards that emphasize critical thinking, problem-solving and analytical writing," said state Superintendent of Public Instruction Tom Torlakson. "California's new standards and tests are challenging for schools to teach and for students to learn, so I am encouraged that many students are at or near achievement standards. "However, just as we expected, many students need to make more progress," he said. "Our job is to support students, teachers and schools as they do." The tests were administered to students in grades three through seven, as well as those in 11th grade. According to the results, 16 percent of students statewide exceeded the standard in English language arts and literacy, while 28 percent met the standard. Meanwhile, 25 percent "nearly met" the standard, and 31 percent did not meet the standard. In math, 14 percent exceeded the standard, 19 percent met it, 29 percent "nearly met" it and 38 percent fell short. In San Diego County, 21 percent of students exceeded the standard in English, with 30 percent meeting the standard, 24 percent nearly meeting it and 25 percent failing to meet it. In math, 18 percent of San Diego County students exceeded the standard, 22 percent met it, 28 percent nearly met it and 31 percent did not meet the standard. "We believe this is testament to the hard work our schools and teachers have been doing to help students meet our new, more rigorous state standards," according to the San Diego County Office of Education. "Together, we're encouraging and building skills in critical thinking, analytical writing and real-world problem solving. These are skills students will need to be successful in school and in life." The results showed that too many children are struggling, however, according to the SDCOE. San Diego Unified School District students fared about the same, with 22 percent exceeding the English standard, 29 percent meeting the standard, 23 percent nearly meeting the benchmark and 26 percent not meeting it. In math, 19 percent exceeded the standard, 22 percent met it, 28 percent nearly met it and 31 percent failed to meet it. The SDUSD said its results were second-best among large districts in the state. "It's important for our families to know that this is just one measure out of dozens we use to assess student performance," Superintendent Cindy Marten said. "This assessment is so different from (previous standardized tests) that attempting to compare is beyond apples to oranges," she said. "It would be like comparing apples to sailboats. Our students are much more than a single test score, and their performance cannot be determined by a single measure." Marten said the workplace is changing, so the way student performance is measured has to keep pace. Torlakson said the overall results continued to show an achievement gap among some ethnic groups, English-learners and low-income families. "Clearly we must continue working to eliminate these gaps," Torlakson said. "Much work needs to be done, but we are moving in the right direction with our efforts to provide extra resources and services for students and schools with the greatest needs." 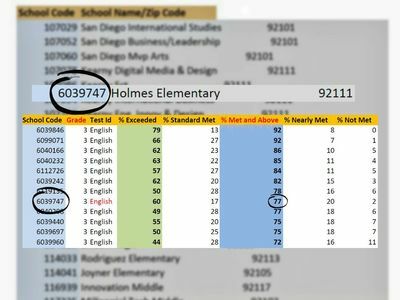 10News broke down the data for the entire San Diego Unified School District, in order to rank each school by its performance on the English and Math tests. To access our data base, click here . Find your school's code from the list at the top, then scroll down to check the results. The information is sorted by grade, from highest to lowest scores. We're pleased to see the San Diego County students generally outperformed their counterparts across the state. In English language arts/literacy, 51% of San Diego County students met or exceeded standards, compared to 44% at the state level. In mathematics, 40% of San Diego County students met or exceeded standards, compared to 33% at the state level. We believe this is testament to the hard work our schools and teachers have been doing to help students meet our new, more rigorous state standards. Together, we're encouraging and building skills in critical thinking, analytical writing, and real-world problem solving. These are skills students will need to be successful in school and in life. Unfortunately, still too many of our more vulnerable children are struggling. We have much to do to close achievement and opportunity gaps, but are grateful to have these baseline scores, which represent an opportunity to focus on the needs of students and support teachers and schools in their work to achieve college and career readiness. The new assessments are too fundamentally different from the old exams to make any reliable comparisons between old scores and new ones. Rather, this year's results establish a baseline for the progress we expect students to make over time. Think of it as pushing the reset button on assessment results—getting a fresh start. These baseline scores represent an opportunity to focus on the needs of students and support teachers and schools in their work to achieve college and career readiness. They are only one source of information schools will be using regarding student progress. Teachers will also continue to gather other valuable information about each student's learning through classroom assessment and daily student work. We're making a change that's not simple. We're moving from "let's get it done" to "let's make it better" assessments, from bubble-in tests that give us results almost a year later to ones that allow us to really connect with what kids know. These metrics matter, but teaching and learning matter more. These assessments allow us to zero in on where kids are struggling or succeeding and tailor instruction to those areas.